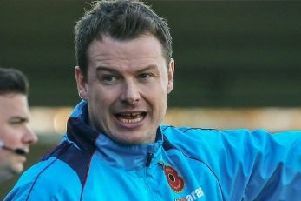 Andy Teague’s second-half own goal ensured Chorley slipped to a first defeat in four against a dogged Gloucester City. Garry Flitcroft’s side were more than worthy of a point but the inability to convert a number of second half chances cost them. The defeat saw Chorley slip to seventh in the Vanarama Conference North table, one point outside the playoff places. Gloucester edged a tight first half but fell behind in the 11th minute as James Dean scored with a superb right footed finish. The lead was cancelled out in the 31st minute as Chris Knowles headed past Magpies goalkeeper Sam Ashton. In a second half that saw Chorley dominate, the winning goal came 12 minutes from time as Teague headed past his own goalkeeper to seal the points for Tim Harris’ side. The Magpies remained unchanged for the fourth game on the bounce as boss Flitcroft kept faith with the team that had won their previous three league games. It was a was a tentative start at Victory Park as the visitors established an early dominance in the air. Goalkeeper Ashton had to be alert catching several high balls while Dean saw his right footed cross strike the upright. The Victory Park pitch was once again proving a hindrance to both sides but somewhat against the run of play it was Chorley that broke the deadlock. Dean latched onto a well timed through ball from Josh Hine, the former beat the onrushing Paul White to the ball and superbly hooked his shot over the Gloucester shot stopper from an acute angle. Despite falling behind early, the Tigers rallied with Tom Webb striking an effort into the side netting and minutes later he ballooned a shot over the bar after smart hold up play from Femi Orenuga. The visitors continued to rally and shortly after the half-hour mark they found themselves level. Fullback Billy Jones whipped a corner in at pace, skipper Jack Harris directed a header towards goal which Ashton brilliantly tipped onto the crossbar but quickest off the mark was Knowles as he headed home from two yards. Matt Flynn and Dale Whitham then headed and curled efforts wide of goal for Chorley but Gloucester continued to have the upper hand winning the majority of the aerial challenges and it showed on the stroke of half time as Ashton pulled off another fine save pushing wide a Harris header. Early in the second half, Jones stung the palms of Ashton with a vicious free-kick and the Chorley ‘keeper had to claim the ball at the second time of asking. The Magpies had a glorious chance to regain the lead minutes before the hour, Hine once again proving a threat down the right, his cross found Jack Dorney in acres of space but from six yards he could only slice an effort against the outside of the post. Buoyed by their start to the second half, the Magpies continued to pile on the pressure, skipper Teague headed over from an Adam Mather free-kick and Hine blazed over after latching onto an Aaron Burns through ball. Gloucester continued to be on the back foot and had goalkeeper Paul White to thank for keeping the scores level. Burns,temporarily finding himself in the left back position, bullied striker Mo Diop off the ball, his searching pass released Dean down the left flank, the latter’s deep cross found Hine but his well directed header was saved. The Magpies thought they had retaken the lead with just over 15 minutes remaining but fans’ celebration were cut short. Dean had turned the ball into the net from the edge of the box, but in the build up referee Anthony Tankard blew for a foul on Burns after his he clattered White with a sliding challenge. Attacks in the Chorley final third had been non-existent in the second period but with just their second chance of the half, Gloucester took the lead. Set-piece specialist Jones whipped a ball in from the right flank at pace and meeting the cross was Teague who inadvertently headed past a helpless Ashton. Mark Ross then saw a 35-yard shot deflected wide for a corner while at the other end Ashton saved well with his legs to deny Harry White. As the game entered injury time, Teague had a chance to redeem himself but he could only head over from two yards with an empty goal gaping.